When I was eight years old, I was given a wool, London Fog, pea coat. I can’t remember who gave it to me now. It was black, with some dark magenta and teal threads woven through. My mom was very pleased that I received a Christmas gift that was so timely and well made. But I really hated that coat. It was heavy and bulky and too big. It was straight up and down with big buttons, and had no saving ruffles or frills. I wore it grudgingly for two winters. I felt it didn’t match anything and made me look like Randy in A Christmas Story . It was not the red coat or a blue coat or a beautiful purple coat I envisioned myself in. My parents (and whoever bought it in the first place) were right, though; it was a quality coat. I think I and each of my two sisters wore it for two winters apiece. And my youngest sister really liked it! Last time I saw it, it still looked nearly new. It’s probably in my parents’ attic, waiting to pounce on my daughter. When I think of my favorite children’s books for winter, I realize that coats are a central theme. I start asking myself, “Why coats?” Here’s what I’ve come up with: A coat is a piece of clothing you wear on the outside–there’s no hiding it. A coat is something that nurtures you and keeps you warm. It’s a necessity in most climates. But the central importance of a winter coat being one you like is this: you only get one. Even in our culture of excess, most people only have one true winter coat. When you’re eight, it’s important that it’s a coat you actually want to wear. 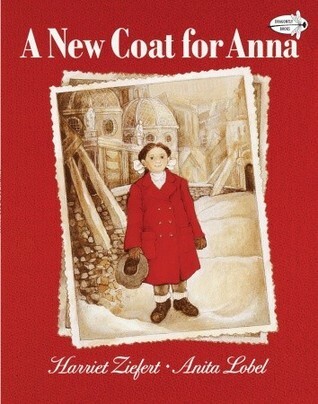 I’ve been reading A New Coat for Anna to my children lately. Set in post World War II Germany, Anna’s mother barters a few of her family treasures as she and Anna walk through each step of making a new coat, from the sheep to the tailor. While I am not sure how Anna’s mother managed to hold on to her heirlooms through the actual war, unless she started out pretty well off, I do love this book. I smile at hearing my children say to each other as they play, “I have no money, but I will give you this apple if…”. Bartering is still a useful skill, right? 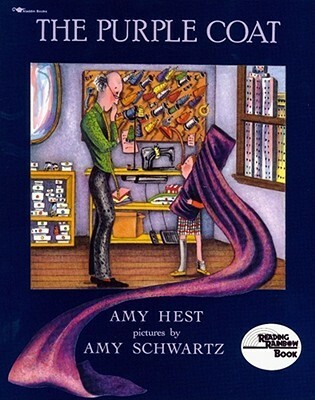 Another great book centered on a girl and her coat is The Purple Coat. This may be the source of my purple coat envy. 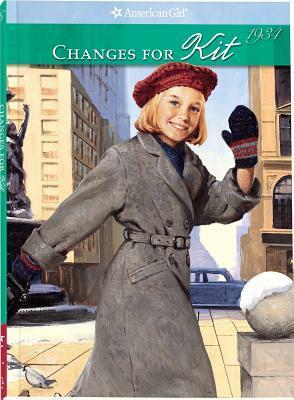 In this book, Gabrielle decides to buck her usual trend of blue winter coats and asks instead for a deep purple one. Her grandfather and mother are unsure about this decisions. With some creativity, what unfurls is the perfect coat, inside and out. I was about six when American Girl dolls and their books hit the market, I was bedazzled by all of it. I saved up money for months to buy Kirsten, although my favorite books were the Molly series. I was so vain–I wanted what I thought was the prettiest doll. In all of those books, the coat is a central piece. I was out of the American Girl stage by the time Kit came into the family of characters, but I read them all the same, under the guise of reading to my youngest sister. Changes for Kit tells of her mother’s resourcefulness and Kit’s generosity, and it’s all centered on a coat. It’s a great book for kids who are just getting ready to have parents read aloud to them out of chapter books, because it still has a good many pictures and it includes a great lesson. So bring out your winter coats, gather some winter coat books, and if at all possible, get your child a coat she’ll really like to wear. This post is part of the 31 Days of Picture Book Series. To see the posts in the series, go here.